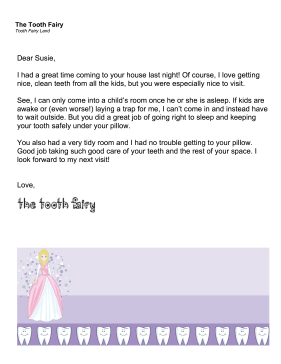 Thank children for good behavior such as a clean room and going to sleep on time with this printable letter from the tooth fairy. I had a great time coming to your house last night! Of course, I love getting nice, clean teeth from all the kids, but you were especially nice to visit. See, I can only come into a child's room once he or she is asleep. If kids are awake or (even worse!) laying a trap for me, I can't come in and instead have to wait outside. But you did a great job of going right to sleep and keeping your tooth safely under your pillow. You also had a very tidy room and I had no trouble getting to your pillow. Good job taking such good care of your teeth and the rest of your space. I look forward to my next visit!